Robert Gober and Sherrie Levine's collaboratively conceived lightbulb asks us to reconsider the status of the "found object." Using a motif associated with Jasper Johns, the work has been described by Levine as cartoonish, "like a Guston light bulb," and shows how everyday objects are translated and transformed by the art contexts that absorb them at different moments and to different ends. Gober and Levine's bulb is a strangely tactile object that doesn't try very hard to approximate its real-word counterpart. 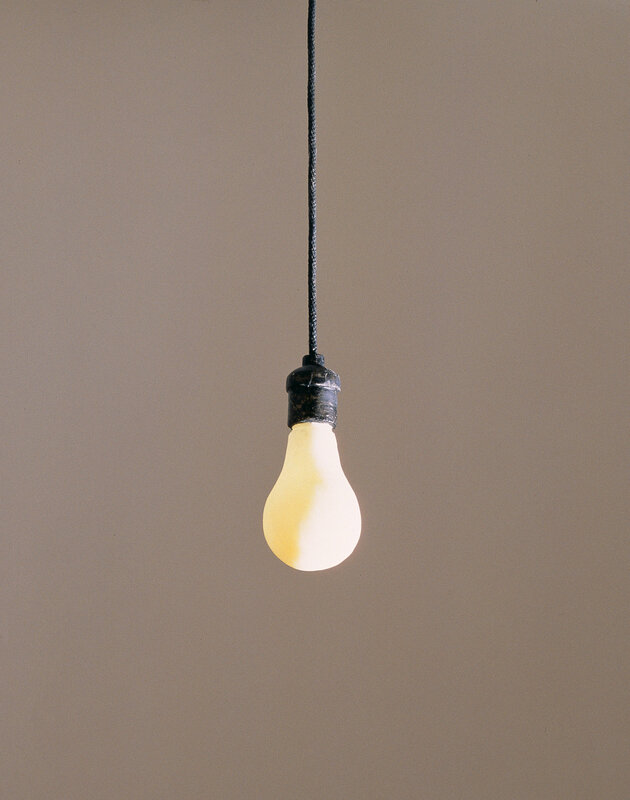 Obviously made of wax (its surface is uneven and dense), a material overtly associated with Gober's practice, the bulb hangs from its useless cord, its blatant lack of utility a testament to its status as art. "Untitled." Take It or Leave It: Institution, Image, Ideology Digital Archive. Los Angeles: Hammer Museum, 2017. https://​hammer.ucla.edu/​take-it-or-leave-it/​art/​untitled-gober-levine/​.